In this article, I will share how we were able to remedy a case of cannabis root rot in a hydroponic setup. Root rot is often thought of as being "incurable" and I've heard of several cases where growers throw away their cannabis plants that are hit by root rot. 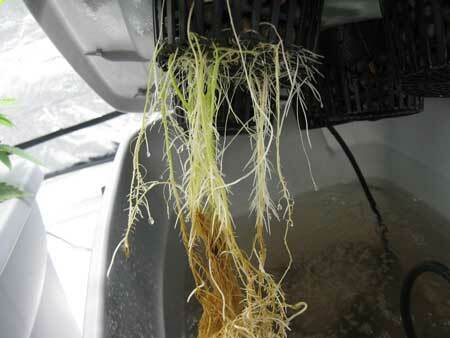 I know lots of growers who have tried hydroponic growing, and gave up after running into root rot for the first time. I have to admit, I've actually thrown a growing cannabis plant away because of root rot – it was several years ago during my first ever try with hydro. I thought I'd tried everything to kill the root rot pathogen, including SM-90 and Hydrogen peroxide (H2O2), When the plant wasn't recovering, I simply trashed it. Looking back now, I see that I could have easily saved that plant. The real trick to getting rid of root rot is figuring out why it's attacking your cannabis in the first place. Once you know the root cause, fix that first! After that, you can use root supplements to help your cannabis plant recover from root rot as fast as possible. Cannabis root rot isn't that difficult to cure if you have the right information. Let me share a story about root rot which was able to be fixed in just a few days. This allowed the plants to continue growing on until harvest. 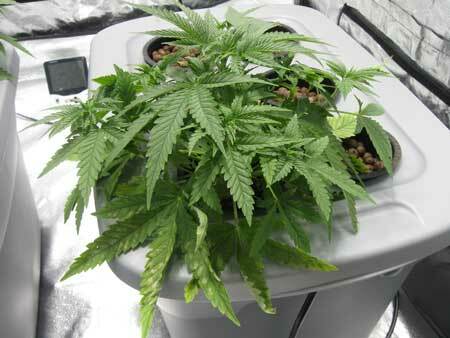 This method should also work for you if you're experiencing cannabis root rot in your hydroponic system. We were struck by an intense heat wave during the middle of this grow. While we do have a very powerful exhaust fan to pull heat out of the tent and through a window, the temperature outside climbed above 100ºF (or 38ºC – unusually hot for where we live), and since we had no AC at the time, the temperature of the entire house was extremely high. Even though the fan was pulling hot air out of the tent, there wasn't really much cool air to replace it in the tent. The temperature of the grow tent climbed to the 90s ºF (mid-30s ºC), which is far too hot for a grow tent, especially with a hydroponic setup. In this type of setup, it is recommended the grow area is kept at a comfortable room temperature (around 70ºF) for best plant growth. In the reservoirs, we could see the plant roots showing signs of root rot. One of our plants was affected only slightly (her roots had slight patches of brown, but she didn't really show any signs of stress above ground). However, the other plant in the tent was struck much worse. She had recently been transplanted into a bigger container, and we suspect that moving her to a new reservoir may have stressed her out slightly, leaving her less resistant to root rot than her sister who wasn't moved at all. 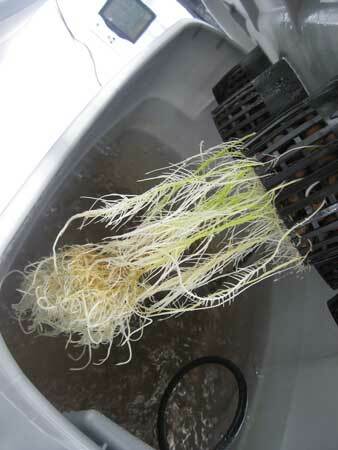 Root rot is a condition that affects the roots of many plants including cannabis, most commonly in hydroponic setups when the plant is not getting enough oxygen to the roots. When the heat rises, the water in the hydroponic reservoir physically cannot "hold onto" as much dissolved oxygen, and the plant roots can more easily become starved for oxygen. A lack of oxygen at the roots (in this case caused by the hot temperatures) leaves plant roots susceptible to a type of bad bacteria that causing browning of the roots which is commonly known as root rot. A plant that is struck by root rot will wilt and show major signs of stress and problems with their leaves. How did we beat the root rot? During the heat wave, we changed from a 24 hour light schedule to a 18-6 light schedule to help reduce the heat (18 hours of light, and 6 hours of darkness). This light schedule is still suitable for the cannabis vegetative stage, but allowed us to use a timer to turn off the light during the 6 hottest hours of the day. This caused the average temperature of the grow tent to drop dramatically. While vegetative growth is slower on an 18-6 schedule than a 24 hour one, we decided to keep the 18-6 vegetative light schedule for the rest of the summer just in case we had any more heat waves. One way we increased the amount of dissolved oxygen available to the roots (to help fight the root rot) was to lower the temperature of the grow room and therefore the reservoir, because water can naturally hold more oxygen at cooler temps. We lowered the level of the reservoir water by several inches to leave a misty air gap of several inches to feed oxygen directly to the roots, similar to an aeroponic setup. Because of the roiling water below, the air in the tub remains at nearly 100% humidity, with plenty of oxygen to help the roots fight off root rot. Last, we drained the reservoir, then we mixed new nutrient water with a huge healthy dose of Aquashield (a source of beneficial root bacteria, which is a staple in our hydroponic grow room). The combination of changing the light schedule to reduce the heat, the addition of an air gap by reducing the amount of water in the reservoir, and the addition of Aquashield did the trick. What we didn't do: We did not add additional airstones or a stronger pump to increase the dissolved oxygen in the reservoir because we already have 2 large airstones and a relatively powerful pump. A grower could put a more powerful air pump to increase the number of bubbles in the reservoir which would help fight against root rot, but in our stealth setup, a bigger air pump would be a bit too loud. We also could have added an expensive water chiller to keep our reservoir cold, but since we have never encountered this problem before we decided that would be a waste. New roots started growing pretty much immediately and both plants slowly recovered, though the rot killed several leaves & slowed down growth for about a week. One of the things I've learned is that every grow has it's own unique challenges. Every time you run into a problem, the best thing to do is learn from your mistakes and use that information to do even better in your next grow. The plants recovered from the root rot, and the grow continued on without a hitch until harvest.